the I-69 porkstension began as an Indy-Evansville route being pushed by folks in Washington, Indiana. that's some mighty fine porkery, getting a road extended a bit southward in Indiana. oh, like all the way to the Texas/Mexico border. IMO, I think that I-73 has greater utility than NC!I-74 as currently planned. I-74's route (specifically east of I-95) looks like it was drawn by someone's 2-year old child.The best solution, IMO, would be to route I-73 along I-74's planned route north of the split in High Point, and then simply decommission the rest. Unfortunately, it seems that the most important part of the 73/74 project (I-95- MB connector) will be among the last built. Who was the original proponent of I-73/74? For example, the I-69 porkstension began as an Indy-Evansville route being pushed by folks in Washington, Indiana. Was I-73/74 an outgrowth of an I-95 link to Myrtle Beach studied in 1982? Or did this simply get tacked onto the end of Bluefield's desire to get US 52 four-laned? The best solution, IMO, would be to route I-73 along I-74's planned route north of the split in High Point, and then simply decommission the rest. Yep. I-73 from Mount Airy to Myrtle Beach, and I-74 from Charlotte to Wilmington. Exactly, plus, NCDOT are going to rebuild/construct I-73 connector between NC 68 and Future I-840/I-73/Bryan Blvd soon, like in 2015 I think. So, we have 2 sections of I-73 under construction right now (NC 68/US 220 connector & the one south of Ellebre) with one more coming up at the PTI Airport area (I-73 Connector). I haven't heard anything about I-74 except the short section of W-S beltway between US 158 and Business 40 that will be under construction soon. So, I have the feeling NCDOT is focusing more on I-73 more. Also, in other I-73 related news, Virginia Senate passes I-73 study. That's a good news. Hopefully they can go forward with that soon. Maybe the study will jibe with common sense and recommend spot upgrades to US 220. Not everything needs to be Interstate standard. Elizabeth, honey, I'm-a comin' to join you. Curious, but does anybody have photos showing US-220 being removed between Exits #25 and #41? Just wanted to make sure that part of the signage upgrade has been done before I update it in OSM. Yeeeep. I can confirm that US 220 was moved back on its original alignment between exit 25-41. Thanks for the conformation. I've now fixed OSM in that area. I assume those are Begin North I-73/West I-74 signs in the background of Exit 25. 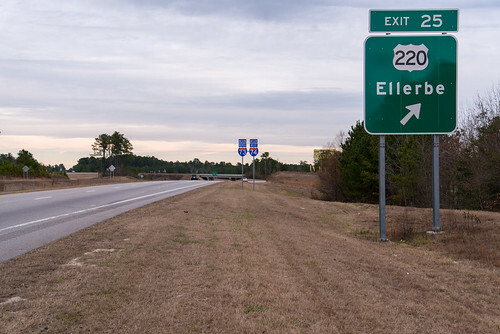 And what exactly is NCDOT's point here .....? This seems silly to relocate only a 16 mile piece of US 220 back to its original alignment IMO. Why either wait until I-73/74 gets completed or else just leave the old road ALT US 220 .....? Not like travelers need more confusion with more sign changes right now, yes .....? Regarding I-73 in Virginia, the reality is that it's no more than a pipe dream of Roanoke, a few cities in the Carolinas, and a few members of this forum. No private consortium is going to float a serious PPP for it because the ROI just isn't there…between the very high construction costs (due to the terrain) and fairly low traffic volumes on a corridor that's really not all that congested. And VDOT doesn't have the cash flow to fund it themselves. That section was never formally rerouted and approved through AASHTO, while previous sections north were before I-73/I-74 were signed. Basically, it was a place holder till I-73/I-74 was more complete further north to warrant the huge signage change in 2013. I've never driven it (the Greensboro-Roanoke corridor), but my daughter did on a recent trip from Greensboro to Pennsylvania, and she said, "I liked that part." Well, technically the grass area is the shoulder; this is common on most freeways built in the last twenty years in the state. Yeah, but for interstate standards the shoulders are to be at least 10 feet wide. I-73 originally was not supposed to go from Princeton to Roanoke and then down to Greensboro. It was supposed to follow the route that I-74 is now in NC. Apparently, some VA lawmakers tweaked the bill to have I-73 go through Roanoke and along US 220 to help the economy in that part of the Commonwealth. Isn't the Smart Road in Blacksburg supposed to become part of I-73? Yes, though the designation, if not the road itself, is based on I-73 continuing further north into WV and Ohio. It doesn't appear that's likely for a long while, or ever. I believe West Virginia is committed in constructing the King Coal Highway (US 52). The only problem is that it's West Virginia. There is a lot of mountain to cut through there and not to many politicians eager to throw money at it; heck, there are still US Routes trying to be built in the state. As of the near future, I-73 will not go any further north than Roanoke. The King Coal Highway, whenever it is completed, will be a four-lane divided expressway ala OH 32 in Ohio or US 50 from Parkersburg to Clarksburg. I-74 in NC will never connect to I-74 in Cincinnati. With our country's current economic situation, the grand plans of I-73/74 will not ever come to fruition. We will be left with a partial US 52 freeway between Ironton and Portsmouth, US 23 currently as is, a US 52 upgrade in WV (maybe), no changes in Michigan, and possibly a completed I-73 between Roanoke and Greensboro. I think I-74 will just exist as a 2 separate interstate just like I-76, I-84, I-86, I-88. 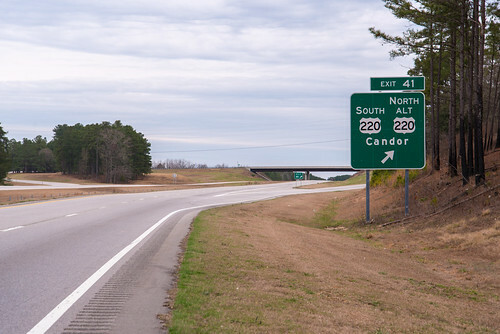 The latest NCDOT Construction Progress Report update on the US 220 (Future I-73) widening project north of Greensboro indicates that the project is seriously behind. While it is projected to be nearly 50% complete at this time, it appears to be less than 30% done. Has anyone checked out the area recently or heard anything about causes for the delays? I think I-74 should end in Wilmington. Running it down to Myrtle Beach isn't all that good of an idea. Well, you are not the first person to say that... but, it's still going to Garden City, South Carolina... some day. I don't know about that section, but I did drove on that section of US 220 south of the proposed connector route, and there was nothing new going on there.. yeah you could say it's seriously behind. I will try to check out the proposed connector area and see if it looks the same as last time I went up there (which is nearly a year) or not.